Successfully Added Snopow M10 Rugged Phone - Octa Core CPU, 6GB RAM, IP68, 4G, Android 7.0, 5.0 Inch FHD Display, 6500mAh Battery (Yellow) to your Shopping Cart. Rugged phones don't get much better than this. The Snopow M10 has a toughened body that keeps the phones powerful hardware fully protected from the harshest environments. With an IP68 rating that ensures the phone is protected from water and dirt ingress, you don't have to worry about this smartphone getting damaged. It's toughened body is like an armor plating that keeps it safe from drops and means no matter how extreme your life the phone can keep pace with you. Dual SIM slots and 4G capabilities let you access the fasted cellular data to date, this ensures a lightning-quick experience when accessing emails, surfing the web, downloading software or playing online games while out and about. Equipped with an Octa-Core CPU that is clocked at 2.4GHz and blessed with 6GB of RAM this phone can handle the latest and most demanding Android games and apps. A lush 5.0-inch screen delivers full HD resolutions so you get a stunning visual feast from all your media and games. 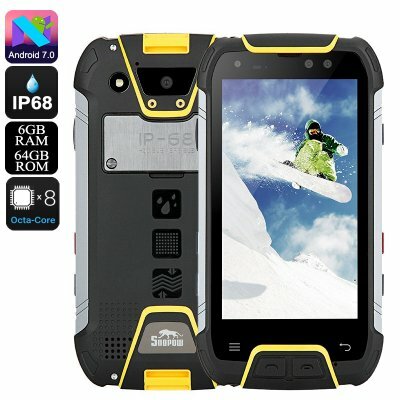 To ensure there is plenty of room for all your files, games and media the Snopow M10 rugged phone has 64GB of internal memory and a micro SD slot lets you add a further 128GB of storage should you need it. Keeping the phone going all day is a 6500mAh battery that delivers around 7 hours of continuous usage times. You can also enjoy a 16MP camera for snapping beautiful images and Full-HD video. The M10 Rugged Phones comes with a 12 months warranty, brought to you by the leader in electronic devices as well as wholesale smartphones and rugged phones..